Should You Flush Out Your Water Heater? Flushing your water heater is just like changing the oil in your car — you flush out buildup that keeps it from running at peak performance. While it's never good to discover an empty water heater because of a leak or serious problem, there are times where purposefully draining it is necessary — even tankless models! Learn why you should flush it out, how often, and how it's done. Why Should I Flush Out My Water Heater? Over time sediments, minerals, lime, and more can build up in your water heater. As these things build up, not only is less water able to be stored (meaning you'll run out of hot water faster), but the appliance has to spend more energy heating things that aren't water. 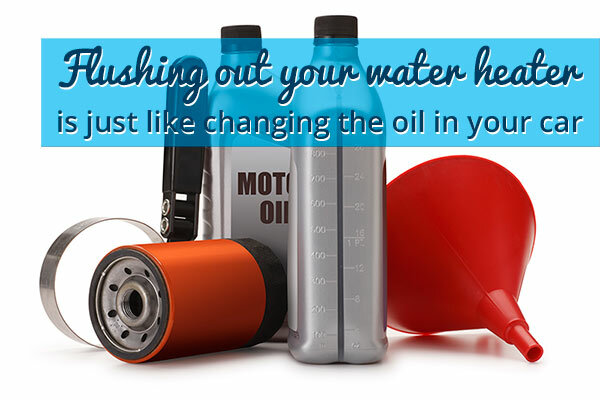 Also, since all that extra stuff is in your water heater, your water can't work at peak performance either. If your water heater goes unchecked for long enough, the buildup can find it's way out of your water heater, into your your pipes, and eventually out of your faucets. Once the sediments, etc. find their way into your water supply, they can keep your water from getting you, your clothes, and your dishes fully clean. Can I Flush Out My Own Water Heater? While you can flush out your water heater, this is one task that is best left to professionals because a) professionals bring a special truck for the contiminated water to be drained into and b) the drained water will be scalding hot — so if you aren't 100% sure what you're doing, things can go south very quickly. You should check your manufacturer's suggestions first, but on average your water heater should be flushed out once per year. Of course, this will vary by region and quality of your water source, but once per year is a good rule of thumb. Is your water heater past due for a flushing? Give us a call at (864) 242-5511 or schedule your service online today. You can even sign up for our Diamond Club to guarantee your water heater never goes another year unflushed!